Blast Off is described as "The modern game of space exploration and technology". It provides a game where players are constantly making decisions as they try to keep their spacecraft in a satisfactory orbit and travel around the solar system. 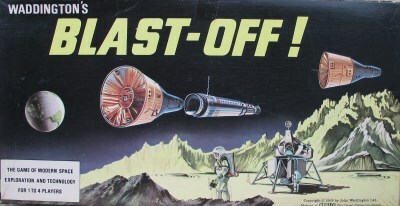 Blast Off was first published by Waddingtons in 1969. The fantastic artwork on the box lid is a real feature of this game, which was published at around the same time as the Apollo 11 moon landing. A huge number of games published in the late 1960's had a space related theme for the same reason, which is hardly surprising. A fully complete game will have the following contents. Price: From £50 plus postage. Check availabily of this game on the "Buy A Game" page.